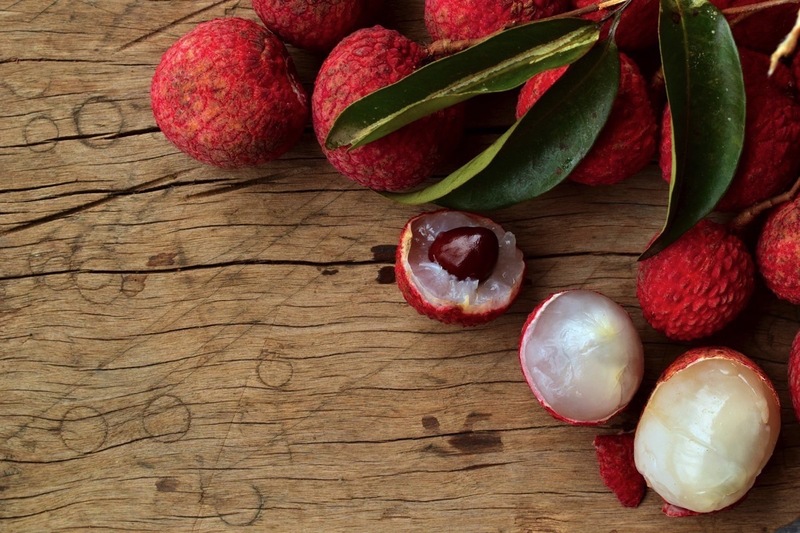 When you look at the lychee fruit, it might look like a distant cousin of the chestnut, coloured red instead of green, or like some weird, round pinecone. Or it might be mistaken as a new form of the walnut or an armoured strawberry. Lychees look like many things, but in reality, they are a very sweet flavoured fruit that perfectly demonstrates how the outside is often unrepresentative of what’s found on the inside. The lychees’ flavour can be described as a cross between a pear and a grape with some distinct floral notes. The lychee originated in the region of southern China and is native to the province of Kwangtung and Fujian. According to some unofficial Chinese records, the lychee is almost 4,000 years old. Aside from southern China, lychees were also cultivated in Malaysia and Vietnam. Today, lychees are grown in China, all over southeast Asia, India, and also in Australia, southern parts of the US, Brazil, and South Africa. Sadly, you can’t grow lychees everywhere—the climate needs to be tropical with lots of rainfall and humidity. But if you live in a place where the climate is hot, humid, and with lots of rain, rejoice because you probably can get fresh lychees in a supermarket near you. If you are new to this unusual looking fruit, you are in for a surprise. Once you rip open its armoured skin, you will find the translucent white, softly textured flesh with a very sweet, perfume-like taste that makes you crave more. Did You Know? The lychee tree is simple to maintain in the right climates, making the fruit increasingly popular to grow. 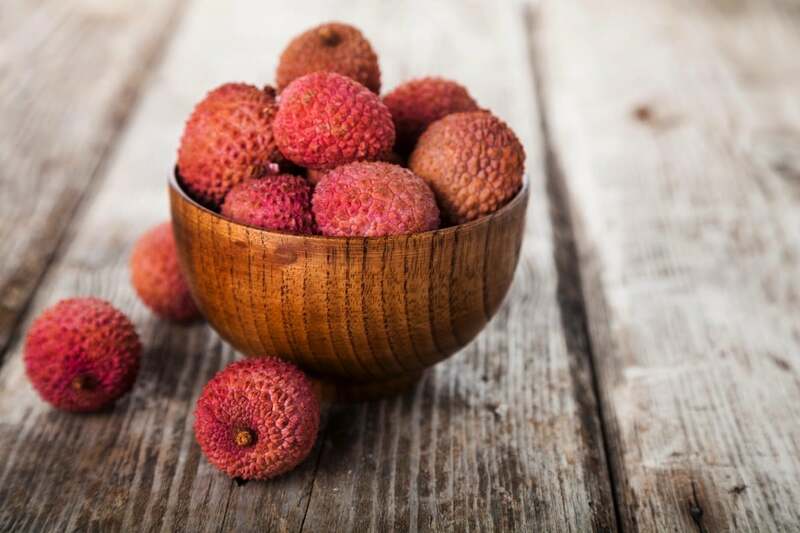 There are many different lychee cultivars depending on where they are grown, but what they almost all have in common is a pinkish-red skin when the fruit is ripe and a sweet, white aril. There are a couple of varieties that mature green with a slight red blush. If you find a lychee with light brown skin, skip it. Light brown skin combined with a wet, sticky outside, and soft to the touch texture usually means the fruit has gone bad. Bought too many? If you find yourself with more lychees than you can eat, you can store them in the fridge for a few days. The skin does tend to turn brown when the fruit is kept in the cold, but you’ll know this is from its time in the refrigerator rather than spoiling. Apart from being eaten fresh, lychees can be eaten dried; then they have a smoky flavour. The fruit was also the star of one folk tale called The Fabulous Lychee Tree or Why Poverty Lives Forever. In the tale a poor woman called Pin Quing, which literally translates as “poverty” from Chinese, lives on the outskirts of a town in a rumbling shack. Other people hated her because of her poverty, calling her names and even spitting at her. Poverty was very old and very poor, but she was a good person who survived by picking rags at the town dump. One day she found a lychee seed which she nurtured until it grew into a beautiful tree. When lychee season came, Poverty picked the fruit from the tree and took it to the market to sell it. She didn’t want to sell it for a high price, and townsfolk bought all of it immediately. Poverty’s lychees were the sweetest of them all. This lead to townsfolk stealing fruit from the tree every year, leaving Poverty without a single piece of fruit. First, pick one that’s bright pink (unless it is one of the green variants) because that means the lychee is ripe and ready for consumption. Lychees do not ripen after being picked, so you want to ensure the ones you are selecting are in their prime. Also, look at the bumps on the surface of the skin. They shouldn’t be highly raised; instead, they should look like slight bumps. The fruit should be firm, giving a little when squeezed. Next, you need to peel off the skin. You can use your fingers or a knife. Some people recommend removing the stem and then squeezing the fruit out. Either way, if the skin is hard to peel, soak the fruit for a while and the skin will become softer. Once you peel the skin, you will find the translucent white flesh inside. Before you eat the lychee, make sure to remove the seed which is set in the centre of the fruit. The seed is hard and smooth as well as slightly toxic, so make sure to remove it. Now that you have removed the seed, just eat the lychee as you would any other fruit. While lychees are great when eaten fresh and on their own, the fruit is also great when used in a fruit salad or eaten in combination with other tropical fruit. You can drink lychee juice and even add it to hot dishes like lychee chicken. Since the fruit is extra sweet, it can also be be served with sweet cocktails. Have you ever eaten lychees? Learn how to eat even more of the best food from around the world right here. This article was originally contributed to by Lay Kuen Yee. Some people eat to live, some live to eat, and Goran travels to eat. He adores new culinary specialties and will always choose to try a new and exciting dish rather than to see an amazing and world-known tourist attraction. Just don't offer him insects. There's always a line and eating insects is his. One Response to "How to Eat: Lychees"